Key components of the Fish Point Park Water Quality Improvements Project include: A: Iron-Enhanced Sand Filter; B: Wetland Outlet Structure; C: Native Prairie Planting; and D: Wetland Restoration and Enhancement. In 2015, the Watershed District finalized plans for the Fish Point Park Water Quality Improvement project. A neighborhood meeting was held in July 2015 to share the project plans with neighbors and receive their feedback. Plans were then revised to incorporate neighborhood feedback. In October, crews began tree and brush removal at the site to prepare for the excavation of the wetland pond. Crews completed the excavation of the ponding area during the first week of November. 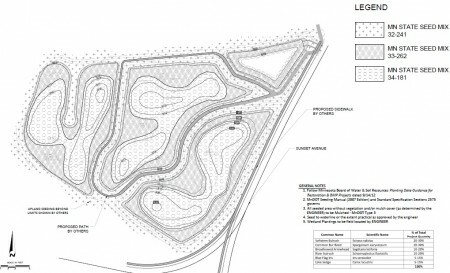 The wetland expansion will increase the stormwater storage capacity of the site. The installation of the outlet structures and the iron sand filter is underway and should be completed by mid-November. To learn more about this project, please visit the Fish Point Park Retrofit Project page. In 2013, the District acquired a quarter acre of land with 350 feet of shoreline on County Road 12 along the north side of Spring Lake. 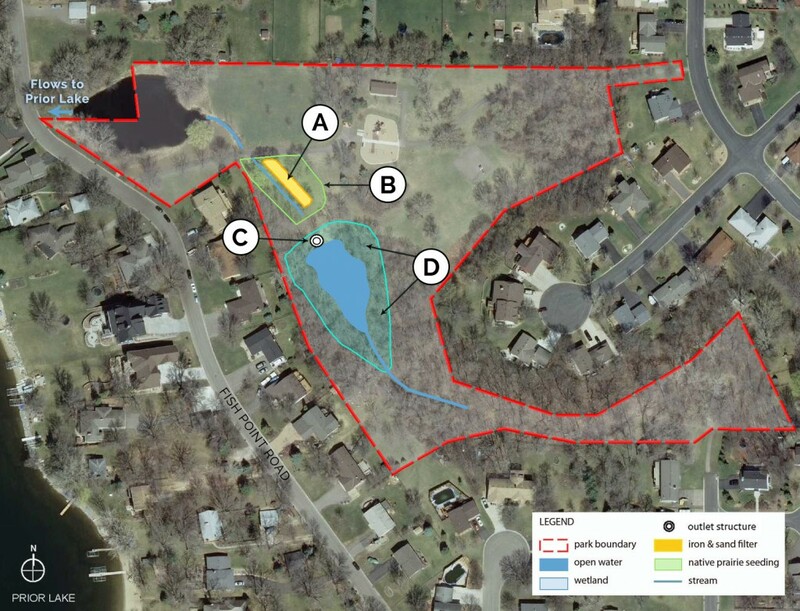 The District acquired the land from Spring Lake Township with the intention of using it for a future shoreline restoration demonstration site. The District is working with Great River Greening, a non- profit organization, to restore the shoreline. As part of the restoration, Great River Greening will be removing the low quality trees and shrubs as well as any non-native species (e.g. buckthorn). This “daylighting” will open up the understory, allowing the oaks to thrive and sunlight to reach the low growing grasses and forbs found in an intact oak savanna. In addition, three different shoreline restoration techniques will be used to stabilize the site including willow waddles, cedar revetment and native plantings. 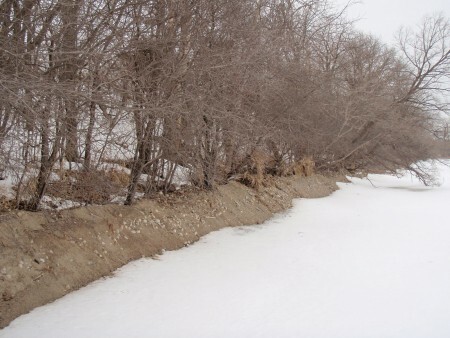 Great River Greening will remove the buckthorn and other low quality trees and shrubs this winter. The shoreline restoration techniques will be installed this spring and volunteers will help plant native forbs and grasses at the site during a volunteer event in May. Please see our volunteer page for more information. To learn more about the project, please visit the Spring Lake Shoreline Restoration page. Stormwater flowing through the predominantly agricultural upper watershed funnels through County Ditch 13 to the ferric chloride (FeCl3) system. 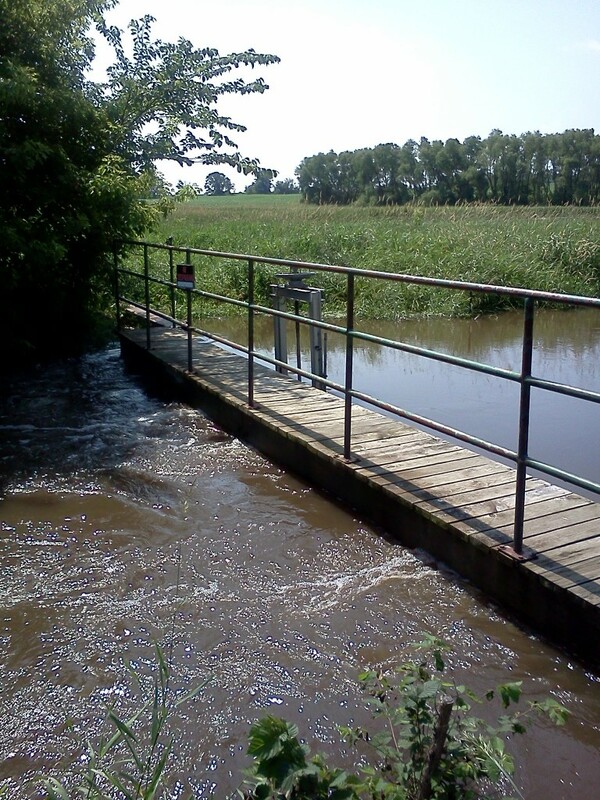 The ferric chloride system includes an upstream wetland, a fixed weir, an injection system, and a downstream desiltation basin. Ferric chloride is injected into the stormwater at a regulated rate as it flows over a fixed weir. Treated water then flows north into a constructed desiltation basin where the iron-phosphorus particles settle out before the water flows into Spring Lake. The weir south of Cty Road 13 and downstream of Cty Ditch 13. The PLSLWD’s monitoring program includes a mix of staff-led, volunteer-based, and contracted work which incorporates in-lake, stream, flow, precipitation and aquatic vegetation monitoring. Data collected in streams and lakes throughout the District is used in order to answer a variety of questions like: How is the water quality changing over time? How does the quality in this stream affect the quality of that lake? How does the quality of this lake compare to other lakes? Is this goal a realistic goal? What are some ways we can try to improve the quality of water? 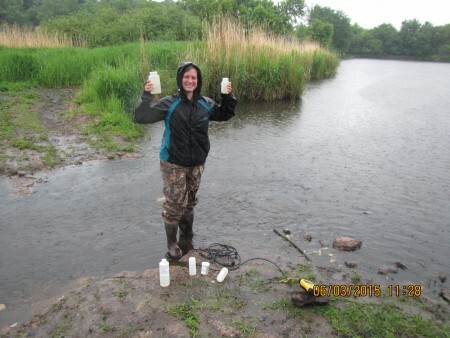 PLSLWD Monitoring Assistant collecting samples at the Ferric Chloride desilt treatment pond. 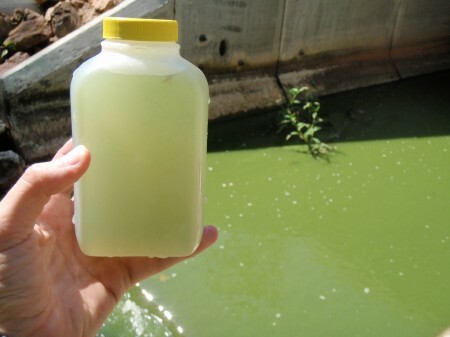 A Total Maximum Daily Load (TMDL) study evaluates the maximum amount of a pollutant that a waterbody can receive and still meet state water quality standards. 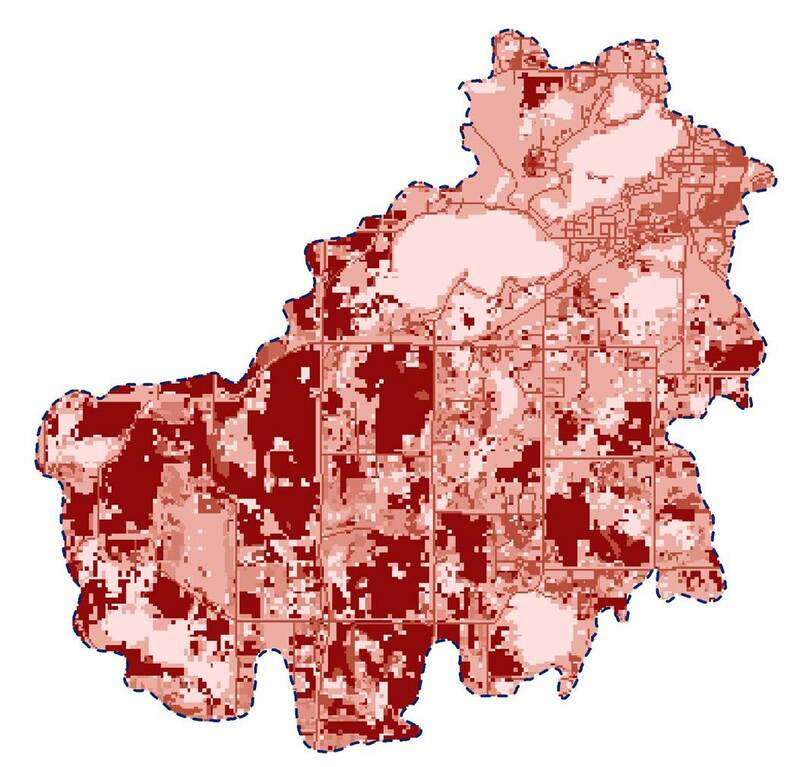 In 2011, the PLSLWD conducted a TMDL study of Spring and Upper Prior Lakes, and found that both lakes were impaired, or threatened by excess phosphorus. This study also determined that about half of the phosphorus in Spring Lake comes from the surrounding land and streams that drain to the lake, and the other half is released internally from the bottom of Spring Lake. This map shows the amount of phosphorus loading in the upper watershed in 2006. The PLSLWD is considering an Aluminum Sulfate, or “alum” treatment to control the internal loading of phosphorus in Spring Lake. Aluminum Sulfate is a nontoxic material that is commonly used in water treatment plants to clarify drinking water. In lakes, alum is used to lower the concentration of phosphorus in the water. Sample of water from Spring Lake’s outlet on August 13, 2012. 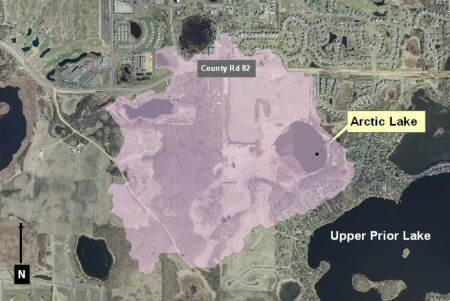 The Shakopee Mdewakanton Sioux Community (SMSC), PLSLWD and City of Prior Lake formed a special partnership in early 2012 to understand the connection between Arctic Lake and its watershed. Together the partners conducted an in-depth study which identified best management practices (BMP) that would address subwatershed runoff and improve water quality in Arctic Lake. Arctic Lake with its subwatershed (in pink). Stormwater volume and excessive nutrients are long-term management challenges for the PLSLWD. 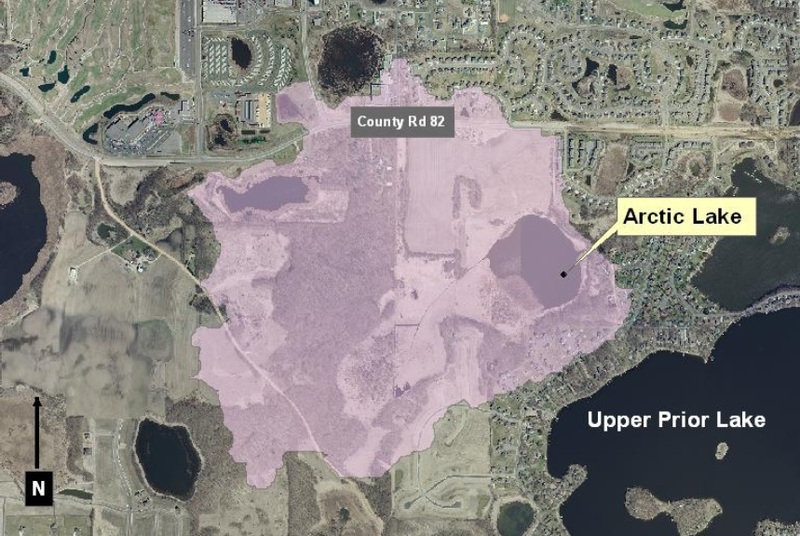 When Scott County planned to improve the County Road 12/17 area in 2013, the PLSLWD saw an opportunity to restore a wetland and team up with the City of Prior Lake and Scott County to make it happen. The City of Prior Lake purchased the land with the wetland and then worked with Scott County and the PLSLWD to put the wetland enhancement project into action. By restoring the wetland, the goal is to reestablish the natural storage capacity and the ability of the wetland to infiltrate stormwater. 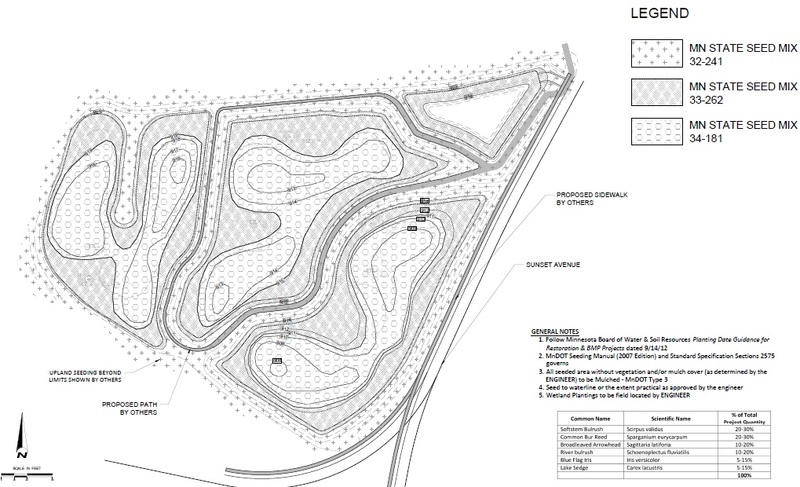 The design plans for the CR 12/17 wetland restoration feature several iron-enhanced sand filters. Common carp are invasive bottom-feeding fish, which tend to uproot aquatic plants; a lack of aquatic plants in lake systems can lead to the plant community being dominated free-floating algae, which is generally undesirable for aquatic recreation. 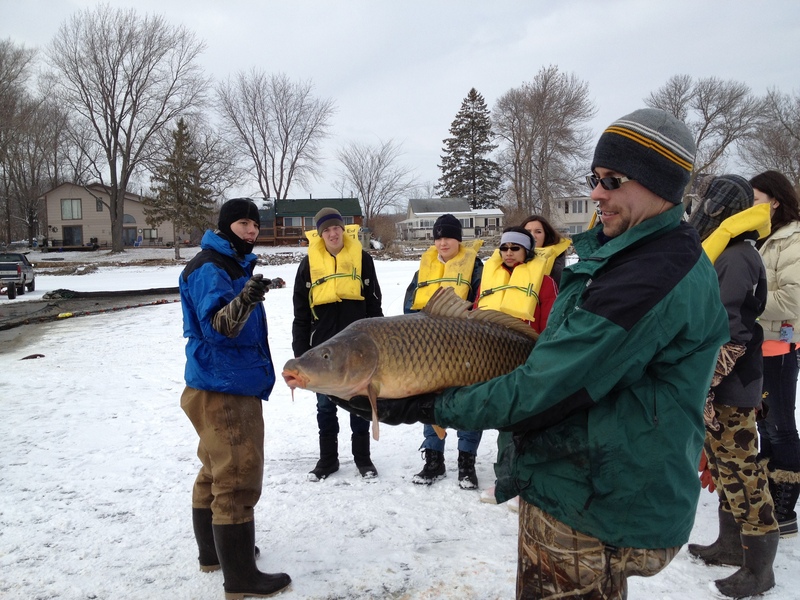 The PLSLWD’s plan for carp management in the next few years will include a variety of methods to estimate and address carp populations in our local lakes. Carp generally grow to about 30 inches in length and weigh up to 60 pounds. The PLSLWD’s volume management efforts focus on identifying opportunities for increasing the water storage and improved runoff management practices in the watershed, and providing incentive payments and other options for achieving those increases. 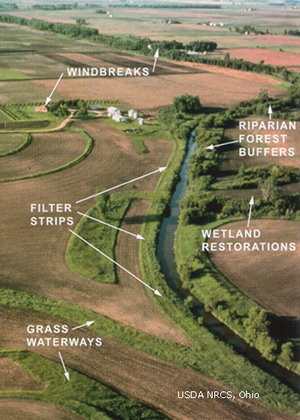 These efforts range from acquiring easements over wetlands to ensure their continued protection, promoting the installation of filter strips along ditches and streams, and restoring and enhancing drained wetlands. Additionally, these efforts have the added benefits of protecting water quality and improving wildlife habitat, as well. Examples of conservation practices that increase water storage and improve water quality (source: MDA).